Climatologists consensus on global warming: poll sample size 79 | Watts Up With That? The graphic [directly above] comes via our friends at skepticalscience, assuring us that while 97% of “climate scientists think that global warming is ‘significantly’ due to human activity,” a shocking 72% of news coverage does not reflect this “consensus” and similarly 74% of the public are not convinced. However, close examination of the source of the claimed 97% consensus reveals that it comes from a non-peer reviewed article describing an online poll in which a total of only 79 climate scientists chose to participate. Of the 79 self-selected climate scientists, 76 agreed with the notion of AGW. Thus, we find climate scientists once again using dubious statistical techniques to deceive the public that there is a 97% scientific consensus on man-made global warming; fortunately they clearly aren’t buying it. Results show that overall, 90% of participants answered “risen” to question 1 and 82% answered yes to question 2. In general, as the level of active research and specialization in climate science increases, so does agreement with the two primary questions (Figure 1). In our survey, the most specialized and knowledgeable respondents (with regard to climate change) are those who listed climate science as their area of expertise and whoalso have published more than 50% of their recent peer-reviewedpapers on the subject of climate change (79 individuals in total). Of these specialists, 96.2% (76 of 79) answered “risen” to question 1 and 97.4% (75 of 77) answered yes to question 2. This is in contrast to results of a recent Gallup poll (see http://www.gallup.com/poll/1615/Environment.aspx) that suggests that only 58% of the general public would answer yes to our question 2.
answering yes to question 2 were economic geology with 47% (48 of 103) and meteorology with 64% (23 of 36). August 2, 2010 in Climate News, Opinion. Oh! My God!……… It’s worse than we thought!!!!!!!! Agreed on the cats. Precious. I hear the 97% figure thrown around a lot, a talking point I guess it is called, but I had never investigated what that was based upon, so I dug a bit and found the one-page report that was published in Eos January 2009 (I found this – http://julesandjames.blogspot.com/2009/01/your-opinions-please.html – to be pretty funny – wonder why Eos made an exception in the case of publishing this particular opinion poll – hmm, and note that that is written by James Annan, not Fred Singer). I was most curious about the exact questions and the number of participants who were climatologists (a lot of folks who use the figure say “97% of climate scientists”). The first question is irrelevant. We have been rebounding from the Little Ice Age for over 200 years! That number should have been 100% and I bet that the 3 respondents who did not go with “risen” chose “remained relatively constant (if any chose “fallen” they should have their credentials checked). And notice the Gallup poll results to this question were not provided in the report. Now the second question is where it gets interesting. Why do you think it was phrased in that manner? Why didn’t they use a less ambiguous statement more in line with the IPCC consensus claims? How does one quantify a “significant contributing factor?” What if the question had been this instead? I am willing to bet that fewer of the respondents would have answered yes, and that is admittedly my opinion. But at least the question would have more accurately reflected what is presented as the consensus. If anyone knows of any similar studies they can direct me to, I welcome the information. Finally, a sampling of 79 climate scientists seems pretty anemic to me. Plus, NASA and NOAA were included in the survey. What do you think are the chances that James Hansen and Gavin Schmidt sent out a note making it mandatory that their underlings take the survey? 97%? Maybe I should file a FOIA request and find out. Cheers! That should put into context the inherent failings of question 2 in the survey. Once again, cheers! I’m surprised it’s so low. In order to be defined as a “Climate Scientist” you must agree with the concensus — otherwise they will dismissively call you a oil industry funded geologist — or something like that. So I’m surprised it wasn’t 100%. Actually the raw data probably was 100%, but they adjusted it becasue they didn’t like the way it looked. 93 % of climatologists agree that their future income is dependent on ACH (Anthropogenic Climate Hysteria). The other 7% are retired. Having read the A J Strata article on accuracy and error that Gail Combs linked in a previous post, I got a chuckle out of the first comment for the linked post at The Hockey Schtick. Where in the WORLD do they get “72% of news coverage doesn’t reflect the consensus”? In America, precisely 100.000000% of news coverage violently agrees with the Carbon Cult. There are some COMMENTATORS on Fox and other places who disagree, but all the “news” types on Fox are strictly aligned with CNN and the rest. Britain’s major media show a slightly wider variety, with the Telegraph generally open-minded. Just goes to show you that 74% of the public are smarter, than 97% of scientists think they are. Indeed the quantum phenomena must be examined in this process. Are AGW morons entangled. You do not know the state of one until you measure the state of the other. They appear to be like bosons in that many of them can be in the same state at the same time unlike fermions. Of course you can make the boson HE4 out of 6 fermions, but that is quite unusual. I do not think you can make anything out of a CRU particle given its morons. Of course you have the Jones exclusion principal that says that logic and AGW cannot exist in the same space at the same time. I agree with Haigh, its quite a catastrophe. hmmmm….. statistics, damn statistics and li……..
well you probably know the rest. “1. When compared with pre-1800s levels, do you think that mean global temperatures have generally risen, fallen, or remained relatively constant? Shouldn’t the number of of folks answering “risen” to question #1 be close to 100%? Is there a strong argument that we haven’t warmed somewhat since the LIA? Question #2 is extremely vague – “human activity” isn’t very specific nor is “changing mean global temperatures” since that could mean either cooling or warming. Moreover, what level constitutes “significant”? Love how the big thing is about having peer reviewed papers, the problem is the peers are bias’d, so if you have a scientifically sound paper that “disputes” the “accepted” theory you won’t have it reviewed. ClimateGate highlighted this perfectly. Now that science is being done in this way maybe we can finally get a result on the Riemann Hypothesis. Can we have a quick vote and resolve this century old problem? Sometimes it pays to think outside the box…….. According to my understanding, these data are not from a poll, but rather a query of actively publishing climate scientists. Clearly, if it were a poll, especially random poll, the support would not be so strong for the idea that human activities are warming the planet. Are any of the cats alive? I wonder if they entered a few no votes just to increase the credibility of the result. No one would have believed 100%, and someone somewhere would have been quoted in the press as saying ‘not me’. By saying 97%, those who would have answered no might think they would need to poll associates? so what was up with the AOL news page I was getting an hour ago? I notice that Anderegg black list is getting promoted by these characters of dubious lineage. You’d think they’d have the common decency to skip over that PNAS skidmark. Oh wait, it’s SkepticalScience. Scratch that.. it’s perfectly in-keeping with their scratty mentality. They have absolutely no shame. There were several hundred thousand articles about Lindsey Lohan that didn’t mention the global warming consensus. I’m not sure why. Maybe those must constitute the 72%. It’s a travesty. * How wide do you think the range of future temperature increases might be, for a doubling of CO2? * The satellite record suggests that warming is proceeding at a rate of less than 2 degrees per century, but the land based record suggests more. Which do you think is the record with the least amount of error, and why? It seems clear to me that if you double CO2 and equivalents (including black carbon) and if you keep reducing sulfates (which cool the planet), you will increase warming. But that isn’t the issue — the issue is, is it bad enough to take steps harmful to our economy? So the question is this: Will the temp increases we will see until alternatives are cheap enough to deploy without major harm to the economy (my estimate: 25 years or so) be so harmful that we have to take steps in the very near future that will throw more people out of work? Or as Roger Pielke Jr. so eloquently suggests, should we put our $ and incentives into R&D to hasten the day of non-carbon technologies that are affordable? I don’t think the current rate of warming for the duration of the satellite record justifies major harm, and the current trend to start shutting down cheap coal plants. That view stems from the satellite temp record. I’ve noted an interesting aspect of the climatologist community. 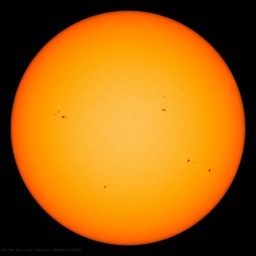 Like bears, they hibernate in the winter and come out squealing about global warming in the sweltering days of August. I heard little of this during “Snowmegadon” this winter. Probably southern hemisphere climatologists were carrying the alarmist load at that time, but they are probably quiet right now, with widespread deaths from what is being reported as an unusually cold winter. JUST DON’T LOOK INSIDE THE BOX!!!! I am not a scientist and barely made it through my elementary science courses for my BA (History and Political Science). But I do not believe in AGW, primarily because I do not trust or believe those (Al Gore, et al) who promulgate the theory. Occam’s Razor applies. Agreed on the public’s concensus: They only want to tax us to smithereens while pretending to be doing something. C002: license to tax & pollute. Great picture of cats. It appears their reaction is intensly ambivalent. Wouldn’t “signficant” mean “within the digits of measurable significance” to a scientist. Sans feedbacks, many skeptics agree that a doubling of CO2 (and the amount increased from 1800 until now) would be within the significant digits. (c.f. Monckton, Lindzen) of the measureable increase. 2. Yes, a portion of the warming greater than the measurement error can reasonably be attributed to human influence. I would suggest a little light reading for these folks from a real scientist. Statistics, damn statistics.. and oh yea. There is no shame anymore on either side of the debate anymore. We will all do our best to make the other side look like chimps. I prefer chimps in lab coats that make accurate predictions better then NOAA. But you know what? I like cats. Cats eat mice, which are bad and spread disease. What are we talking about again? I’m reminded of the election participation figures in the old Soviet Union. And it means about as much. then I qualify as a believer. 3) it’s a problem that needs fixing? The problem with this survey isn’t the sample size; it’s the questions. The whole thing smells like bait and switch. They aren’t using this survey result to justify 1 & 2; they’re using it to justify ACTION on 3. Indeed the quantum phenomena must be examined in this process. Data smashers are used to render measurements into subinformative particles called morons. Near absolute zero, these coalesce into a Schmooze Condensate; they act as one. Remember.. Nine of ten cats ‘probably’ prefer Shrodinger..
29 July: Australian Climate Madness: Poll: Most Australians want tough action on climate – really? Sounds pretty compelling, doesn’t it? A little research and an email to Prof Louviere elicits more information about the study (see here for PDF). It was different from most surveys in that it required participants to choose between alternative emissions reductions scenarios, rather than answering Yes/No questions…. But what is the obvious flaw with all this? Clearly, it is the assumption that the requirement for an ETS is not up for question, and that implementing one will somehow be beneficial for the environment. The choice is only between different types of ETS, and, naturally, respondents are going to choose the one which they are informed will hurt them least…. there were some clues way down in Cubby’s article that something was up with this poll, so a big thanks to the folks who got to the bottom of it, even though most of the readers of SMH remain ignorant. Ditto, the cats, though I wonder if observing them will kill them worse than the fact that they’re sitting in the middle of a road. PS> Not so much a cat lover as dog lover, but I must agree the LOLCatz are appropriate and somewhat droll. I also heard recently that at least 97% of priests believe in God. Interesting.. I concur, it is my “belief” that all the zeros ARE on the x=-1/2 line. You want proof ??? You mean actual proof? Now that’s a bit trickier. Paul, you are correct, the same old manipulators up to the same statistical shenanigans. Having secretly manipulated the data, hidden declines, blocked non partisans of the CAGW love-in, they are now stuffing the ballot box in a survey. Paul, I know you are not a scientist (sociologist or political scientist are you?). If you were a scientist you would understand that consensus in science is anathema to progress. Einstein was once the only believer in his theories when the consensus was all Newtonian physics – there was widespread disparagement of Einstein in the early days. As the testing of his theories progressed through experimentation by skeptics, they came more and more to accept his theories. A poll, were it conducted a few years after his theories’ publication would have had, perhaps, 97% against it. Now, even though much of his theoretical stuff is still current, there is debate about his gravity theory and quantum physics – even Einstein himself had reservations about it, being aware of its incompeteness and shortcomings. Scientists are still picking away – its what they do and certainly Einstein’s work is considerably more advanced than flegeling climate science (climatologist was underlined in red on MS Word as recently as 2007 and it wasn’t in Oxford Dictionary on line at the time). The state of climate science is at the phlogiston stage of physics. The terrible thing for these ‘quality scientists’ is that there is a good probability that the public may turn out to be right and we will know it in the coming 20 years of cold weather. Your point #3 is exactly what I meant, only you said so in fewer words…. Seems like supporters of AGW can never separate themselves from Gelbspan…..
And people wonder why MSM is dying fast. The internet can not be controlled and the real (un-managed) climate (as opposed to realclimate) data is available to anyone who wants to look. I have a delayed choice eraser. Are the cats gone yet? Pielke Sr. would have answered Yes, because he believes that land-use changes have had the most impact on the climate. (E.g., deforestation, agriculture, irrigation, river-damming, etc.) Question 2 should have asked only about CO2. Of course man has contributed to this warming. Didn’t we move the stations to warmer places like airports and urban centers? Didn’t man “adjust” the data? The apes didn’t do it. Duh! So…If you ask 100 astrologers if they believe in astrology I wonder if at least 97% would answer “Yes”? A recent article in Super Science by Dr. Manic Michael reports the results of a three decade long study on the trigger mechanism for turning an individual into a serial killer. The indisputable results of the study show that the feeding of rhubarb to children under the age of three will result in their random murdering of people by the age of 30. Mr. Stefan McSkeptic, a retired probation officer, has criticized the study claiming that the sample size was too small. Mr McSkeptic suggests that more than one serial killer should have been studied and that other factors should have been considered, such as the individual becoming an alcoholic by age 8 and a heroin addict at age 11. Dr. Manic Michael’s team has dismissed Mr McSkeptics comments as being unworthy of rebuttal due to the fact that he does not have a graduate degree in Serial Killing. This epic study by the highly esteemed Dr. Manic Michael was funded by a $3 million grant from the Incredible Tings foundation. Dr. Horace Michael, the director of the Incredible Tings foundation, has praised the work of his son Manic. Since Mr. McSkeptic has confused an insignificant number of people, however, an independent review has been ordered by Dr. Horace Michael. Dr.Forest Michael conducted the review last Tuesday morning and submitted his report on Tuesday afternoon. He confirmed the validity of the study based on the fact that it had been peer reviewed by his wife. He also said 97% of the rest of his family agreed. what is connecting the picture and article? Reporting that there is a possiblity other than anthropogenic warming is not the same thing as reporting evidence that contradicts anthropogenic warming. A shocking 100% of news coverage is the former and not the latter. Remember, however, Ross Gelbspan never won a Pulitzer, and he did not discover the so-called disinformation campaign he is so widely credited with, but he is at least responsible for an amazing set of repeated talking points http://www.americanthinker.com/2010/07/the_left_and_its_talking_point.html which pop up in all places, a cute graphic that says the media gives too much balance to skeptics………. The “survey” results were reported in January 2009. Regardless of the poorly worded questions and the rather dubious manner in which the highest concurrence was determined – i.e. amongst the 79 (of a total of 3,146) who “listed climate science as their area of expertise and who also have published more than 50% of their recent peer-reviewed papers on the subject of climate change” – one has to consider this an incredibly shrinking consensus. After all, the authors were talking about “detection and attribution” were they not? According to Mike Hulme (June 2010), such a “consensus judgment” was reached by “only a few dozen experts” [of the IPCC]. And at one time 97 percent of astronomers thought the earth was the center of the universe. Science has never run on consensus. “My theory must be right because everyone said it was right, but Galileo and Kepler” didn’t cut it in the 17th century and it shouldn’t cut it in the 21st. Consensus is important in politics, not science. If you want the “right” answer you have to ask the “right” questions in the “right” way and of the “right” people. I have hit this sort of thing quite often in tests and questionnaires, which I will either ignore or just stop answering. This can cause trouble but it makes life interesting. Ps our cat has a thing about boxes as well. So 9 out of 10 ‘climate scientists’ who believe in Anthropogenic global warming believe in AGW? Wow, I didnt see that coming! Now call me stupid but if these ‘scientists’ have a vested financial interest in AGW and precious grant/research monies depend entirely on these ‘climate scientists’ looking for and finding evidence of AGW, then call me cynical but would they not do their best to keep the monies rolling in? If you livelihood depends on AGW it would be unwise in the extreme to do yourself out of a job, a career and any chance of future employment, obviously moral integrity and duty to the wider truth has to take a subordinate role because for most people putting bread on the table comes first and only a brave few would risk the spiteful wrath of the priests of the orthodoxy. That is what the priesthood have counted on for years and it has proved very effective, it carried the USSR for years. Not if you glue their paws to the bottom of the boxes. I am going to pay for that, aren’t I? wow and here I thought skepticalscience was firmly in the pro-AGW camp, but they just produced a graphic showing that 97% of climate scientists surveyed hold the same position as deniers. Nearly all deniers agree that temperatures have increased since the 18th century. Who’d of thunk it. Here in Australia, we see this graphic and statistic spattered across the media almost every day. It’s interetsing to discover the poll sample size is only 79!!!! LOL You just just can’t make this stuff up. So I’m surprised it wasn’t 100%. Actually the raw data probably was 100%, but they adjusted it becasue they didn’t like the way it looked. I bet if they polled 79 retired climate scientists the result would be almost the opposite. Atmospheric Scientist Dr. Joanne Simpson, the first woman in the world to receive a PhD in meteorology, and formerly of NASA, who has authored more than 190 studies. who got it right way back? But wait a minute, a recent post by Berman and Pielke Sr.
on the basic question of CO2 as a greenhouse gas? to an extent you are not aware of. time by choosing the Heartland tours for adulation. Or Photoshop. Digital reality > reality. 97% of polar bears say their paws prefer it! Consensus is not proof of the validity of the science; it is political influence of public opinion. As many of the above writers above have pointed out pushing back the frontiers of science ignores consensus. Many of the poll respondents had their own self interest in mind. The ambiguity of the second question makes any of several possible interpretations possible as also has been pointed out above. The previous article in this BLOG summarizing Ross McKitrick’s assessment of the quality of temperature GHCN data is the case in point. I also refer you to Gail Combs comment. Any of the possible reasons for global temperature anomalies are reason enough to answer in the affirmative. However the responders were manipulated by the EOS authors to mean CO2 influence on global temperature. On the other hand politicians use polls and other statistical data on demographics to influence the public. Poll results are influenced by the responders own self interest. The questions are chosen by the pollster to incite a given response in favor political position. When the results are presented the politicians tell what the results mean. What amazes me about the current political climate is that the politicians are ignoring the polls. Do they think that the results are tainted and can be ignored? This and other poll “science” or rather “science polls” are quite entertaining. Of course it would have added to the confusion if they had added the question if the respondents believed “if a significant part of the warming was attributable to factors other than human activity” which should have hit the 100% “Yes” answers in both groups. The same logic applies to the second question: in view of the pre-1800’s history of earths climate human presence and activity are futile as both sceptics and alarmists will agree. You only need to go back to the more recent ice ages to acknowledge this. Both the timescale and the use of the undefined “significant” and the fact that is is a poll make this excercise a complete waste of time. Still, for psychologists and sociologists it may be interesting material. I still think it would be interesting to run a poll asking people in the general public to say, off the top of their head, how much they think average global temperatures have changed over the last 100 years. Perhaps this could be compared to what various news reporters and government officials are willing to say as well. In case anyone wants to comment – the original graphic was here: http://renegadeconservatoryguy.co.uk/global-warming-the-debate/ . 76.5436% of statistics are made up on the spur of the moment. Slightly off topic but has anyone else noticed that when you talk of empirical evidence ,and past observed recorded data beyond 200years ago on the Guardian newspapers(uk) enviroment blog you get blanked by warmists who dont seem to want to talk about it.Strange that. The flaw seems to be in the original experimental methodology. Of course. Don’t they use a hockey stick for that? True scientists wouldn’t even respond to such a ridiculous, agenda-driven “poll”. made in 2007 by the Hadley Centre and the interesting observations of Phil Jones which may well be haunting him today. Oh! and before some wretched troll points out that the MET office header proclaims that the last update was 24.11.08, be so good as to scroll down to Rainfall records where you will find that these were updated in November 2009 and record the Cumbrian flooding of that time. The work of science has nothing whatever to do with consensus. Consensus is the business of politics. Science, on the contrary, requires only one investigator who happens to be right, which means that he or she has results that are verifiable by reference to the real world. In science consensus is irrelevant. What is relevant is reproducible results. The greatest scientists in history are great precisely because they broke with the consensus. To all those who are picking apart the questions asked, remember the first law of polling: if you want the right answers remember to ask the wrong questions. Theys doin’ a cat scan. The warmists know they are onto a loser as the ‘ordinary people’ have now had their horrendous heating bills from trying to keep warm last winter – and would really like the warming to kick in as soon as possible !! Much of the speculation here is off base. You can find the specifics on the “survey” that found 97% of publishing climate scientists favoring the IPCC concensis in the most recent posting on Real Climate. Read it to help clear up the misunderstandings. Any reading of the censorship prone RealClimate will only result in more misunderstandings, not less. There is no more mendacious, pseudo-scientific, self-serving and unpopular climate blog than the odious realclimate. If it weren’t for Soros and Fenton money, and the money dishonestly misappropriated from taxpayers, RC would have shut down due to lack of interest years ago. RC is run by Michael Mann and Gavin Schmidt, and the truth is not in them. You are being far too generous. The truth is not even near them. Their lies are so bad that you can’t even believe the opposite of what they say. Don’t you just love campfire stories ? Not sure if anyone brought this up. quote it all the time, in fact most are from the US. the remaining 4% were from institutions in 21 other nations. This was posted in response to RC’s gushing endorsement of this “survey” result. Of course it was never published by those eminent and ethical “scientists”. 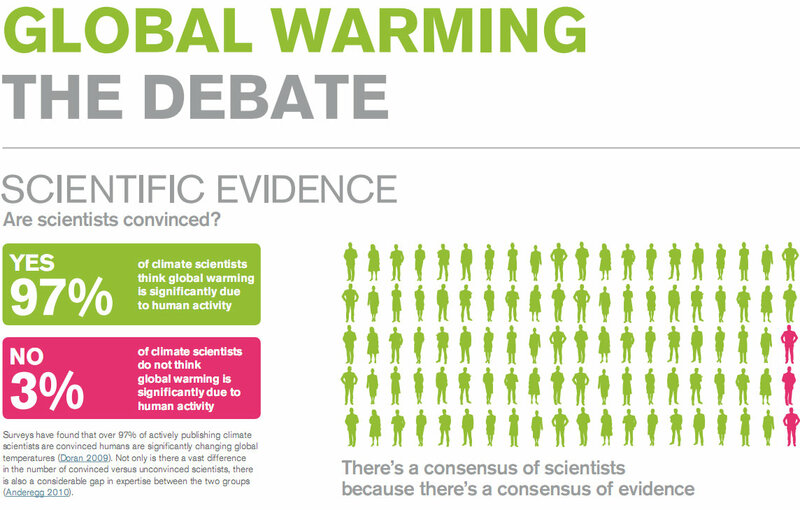 So what exactly is so objectionable about the skepticalscience infographic claiming that 97% of scientists working on climate change agree with the IPCC consensus? It seems to be factually well-grounded, since it is based on two recent peer-reviewed publications using different methodologies that nonetheless find convergent evidence. In a summary of their survey on the opinion about global warming among Earth scientists (see Eos, 90(3), 20 January 2009), Peter Doran and Maggie Kendall Zimmerman conclude that the debate on the role of human activity is largely nonexistent, and that the challenge is “how to effectively communicate this fact to policy makers” and to the public. However, I argue that neither of these conclusions can be drawn from the survey. For example, one issue that is much discussed in the public debate is the role of greenhouse gas emissions in global warming. Perhaps there is not much debate about this issue among scientists, but this cannot be concluded from the survey, in which nothing is said about such emissions. In the second question of their survey, Doran and Kendall Zimmerman refer only to “human activity.” Furthermore, even if scientists agree that the effect of human activity is “significant,” which is the word used in the second question, they can have very different beliefs as to how large, and how dangerous, this effect is. The feature article “Examining the scientific consensus on climate change,” by Peter Doran and Maggie Kendall Zimmerman (see Eos, 90(3), 20 January 2009), while interesting, has a primary flaw that calls their interpretation into question. In their opening sentence, the authors state that on the basis of polling data, “47% [of Americans] think climate scientists agree… that human activities are a major cause of that [global] warming….” They then described the two-question survey they had posed to a large group of Earth scientists and scientifically literate (I presume) people in related fields. While the polled group is important, in any poll the questions are critical. My point revolves around their question 2, to wit, “Do you think human activity is a significant contributing factor in changing mean global temperatures?” Note that the opening sentence of their article uses the phrase “major cause” in reporting the results of the polling, while the poll itself used the phrase “significant contributing factor.” There is a large difference between these two phrases. The non-expert writer of this analysis of credibility, James W. Prall at Electrical and Computer Engineering, University of Toronto, is not only not an expert in the field of climate change, he is also not an expert in electrical and computer engineering, at least not in the sense that some might assume from his University of Toronto affiliation. Mr. Prall is an administrator who looks after computers at the university, not a scientist or even a lowly researcher in the field. If it strikes you as odd that an editor at the National Academy of Sciences would accept someone with a life-long service and programming career in the computer field to judge the academic credentials of scientists, it gets odder. Prall’s methodology in determining who is credible as a scientist involves the use of Google Scholar which, he explained last fall to the Canadian Broadcasting Corporation, “studies just the scientific literature. They look at peer-reviewed journals.” Prall uses Google Scholar to determine how often people publish and how often they are cited. Based on the number of hits that Google Scholar produces – not on any analysis of the actual content of climate studies – Prall determines scientific merit. It’s an easy and straightforward process, he explained, that anyone can perform. Does Google Scholar really limit itself to scholars? No. Search “Al Gore” on Google Scholar and you will find some 33,200 Scholar hits, almost 10 times as many as obtained by searching “James Hansen,” a true scientist and easily the best known of those endorsed by Prall as a bona fide believer. Neither does Google Scholar limit itself to “just the scientific literature.” Google Scholar finds articles in newspapers and magazines around the world: 113,000 in the New York Times, 22,000 in Economist, 21,000 in Le Monde, 16,000 in The Guardian. Prall maintains his data on a portion of the University of Toronto website (this is his personal website, and not affiliated with the university, he is careful to note). I first came across him while in the CBC’s studios last fall, when he was invited by CBC Radio to counter my views by presenting a forerunner of his study, which was then unpublished. His results then differed little in the message they conveyed: “According to Jim Prall’s database, of the 615 scientists who published papers on climate change, the sceptics are outnumbered 601 to 14,” CBC announced. Prall’s now-published work has some important differences. To give his work the trappings required to be published in the Proceedings of the National Academy of Sciences, his study has several real scientists as co-authors, the best known and most credible among them being Stanford’s Steven Schneider, who was previously best known for predicting global cooling. Works beautifully. Al Gore turns up in such “climate sensitive” academic publications as Vanity Fair, Sierra Club Books, and HollywoodJesus.com. This is just more poodle poop. Again, what’s so objectionable about the Doran & Kendall-Zimmerman survey? I see a lot of complaints about the way the questions were worded, but frankly, I don’t see the issue. In which relevant way is a belief that human activity is a “significant contributing factor” to global warming different from believing that human activity is one of the causes of global warming? As for the number 97% coming from a 76 out of 79 (question 1) or 75 out of 77 (question 2), again, what is the relevance? Those 79 individuals are only the ones who indicated that climatology was their main field of work and that more than 50% of their output in the last 5 years was on the topic of climate change. 79 people with those credentials is quite a lot. But crucially, if you take the other categories (with presumably more responders), you still get around 90% of agreement with the IPCC. Are you any happier or any less willing to believe that there is a consensus on this topic with these figures? It is only when you go to the “Non-publishers, non-climatologists” that you get a below 80% agreement with the IPCC. And still, that is almost 80%. Are you any happier with this figure? Regarding the issue of self-selection, yes, participants self-selected. The question is, if you think this had a potential to bias the results, WHY didn’t the scientists who disagreed with the IPCC’s conclusions voice their views? In other words, why do you think that the self-selecting bias should go in the direction of the IPCC, and not on the direction of those who disagree with it? Again, what is so objectionable about this procedure? If you think it biased the results in favor of agreement with the IPCC, can you explain how it did so? You can work wonders with duct tape and superglue. It’s cruel to make Dedicated Climatologists think about Schroedinger’s cat, since it is quite painful and near impossible for them to think outside the box. The Doran objection is clear, 75 scientists is not representative of any consensus. PNAS reviewers and author’s William R. L. Anderegg, James W. Prall, Jacob Harold and Stephen H. Schneider are apparently Google Scholar illiterate since searching for just the word “climate” with an author’s name will bring results from non-peer-reviewed sources such as books, magazines, newspapers, patents, citations, duplicate listings and all sorts of other erroneous results. There is no “peer-reviewed journal only” search option in Google Scholar. Not to mention using those search techniques will get results from authors with the same name but who are completely different people. For instance even when using the author’s name in quotes or advanced search operators such as “author:”, Google Scholar will still show results from authors with only the same last name. Thus authors with common names will get inflated results. Take for instance using author “Phil Jones” (the infamous former CRU director of climategate fame) with the search word “climate”, you get almost 5000 results! They cherry picked away skeptics, “we imposed a 20 climate-publications minimum to be considered a climate researcher”. So if a scientist published only 19 or less papers on the climate he is not considered an “expert”. They did this intentionally as they noted “researchers with fewer than 20 climate publications comprise ≈80% the UE group.” Volume of publications does not indicate scientific truth. It cannot be ignored that skeptics extensively publish peer-reviewed papers so they have to use this propaganda to subjectively define “experts”. By default Google Scholar is set to search both “articles and patents” yet no mention of searching only for articles is in the paper. So why were they searching for patents and how is a patent that contains the search word “climate” a relevant “climate publication”? An attempt to reproduce the results using their methods was unsuccessful. The first result listed is “Very high resolution interpolated climate surfaces for global land areas” by author Peter G. Jones of the International Center for Tropical Agriculture, Cali, Colombia. The third result listed is “Organizational climate: A review of theory and research by author Allan P. Jones of the Department of Psychology, University of Houston. The seventh result listed is “Psychological climate: Dimensions and relationships of individual and aggregated work environment perceptions by author Allan P. Jones of the Department of Psychology, University of Houston. Clearly these were not papers from Phil Jones of the CRU on climate change. The fifth result down is “Climate since A. D. 1500”, a 1992 book by Phil Jones not a peer-reviewed paper. Chapter 13 from the same book is found later in the same results as a separate listing, “13 Climatic variations in the longest instrumental records, thus counting the same book twice. Citations for this book are counted over 20 times in Google Scholar, further inflating the results. No mention of turning off citations is mentioned in their paper as this feature is on by default in Google Scholar and in the “CLIM” link from Prall’s page. The climate total number of 724 for Phil Jones on Prall’s list is unverifiable using the methods outlined in their paper and appears to be made up. It appears they only verified the top four results for their “citation analysis” not for the total amount of results using the search word “climate” for each of the 1372 authors. Conclusion: the study is worthless due to Google Scholar illiteracy and Cherry Picking. Doesn’t that simple comparison seal the deal and expose the vacuousness of the sRs argument? The answer to the sRs question as to “what is so objectionable” about the claims emanating from this survey is pretty simple and straightforward: IT”S A BLEEPING LIE! Those two statements are not remotely the same thing and to claim that they are, something sRs nonchalantly and repeatedly does, nakedly exposes his biases. Connecting the two versions as one is quite “objectionable” thank you very much. One can see why it’s so easy to make the pro-AGW crowd believe “unequivocally” that “it must be CO2.” This particular survey mini-saga reflects the larger debate, where many well-meaning people (and some very sinister wolves mixed in) needed to “save the world” because they swallowed the AGW hook deep and it got a good hold of them. Unfortunately the hook held poisoned political propagandist bait, but I digress. The bottom line is it’ll be hard to set them free of AGW’s grip without gutting them. Once you have this stuff down in your core, it’s hard to let go. I am still optimistic that reality prevails and it does look like the worm has finally turned. But let’s keep steering it right (as in correctly) cuz we have a ways to go. I don’t plan on stopping anytime soon. See, Poptech, it’s that easy. So next time simply tell sRs, “Nice try but that’s a lie.” Keep it short and sweet like…um, I did. Carry on. Doesn’t that simple comparison seal the deal and expose the vacuousness of the sRs argument? The answer to the sRs question as to “what is so objectionable” about the claims emanating from this survey is pretty simple and straightforward: IT”S A LIE! A copy to it have been sent to the Email of your Webmaster(webmaster@stateclimate.org). Thanks.